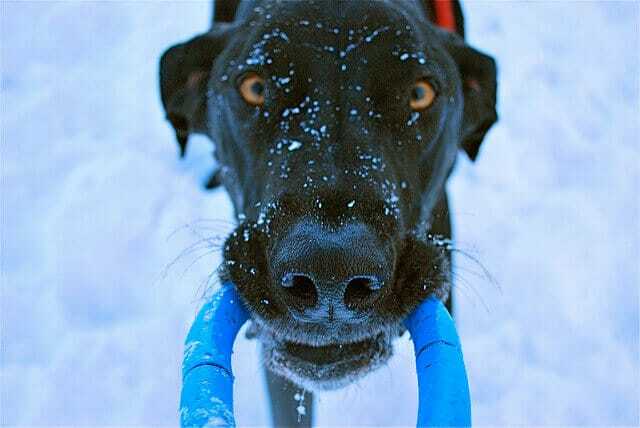 Your all-inclusive guide to the best tug of war dog toy. In-depth dog tug of war toy analysis, including why dogs want to play it, benefits of playing tug of war with your dog, and of course…the best dog toys for epic tug wars! 5 High Quality Ropes for your best friend! This combo-pack satisfies your dog’s tugging, chewing, and shaking needs. If you have more than one dog, odds are you know a thing or two about the game of Tug of War! More often than not, they will use anything they can sink their teeth into for the game, and this includes shoes, slippers, socks, towels, couch cushions, throw rugs and more. When the instinct to chew and tug hits your puppy or dog, they simply have to find something (anything!) to tug on. Why do Dogs Play Tug of War? It’s not that they intentionally seek these items out with the intent of destroying them, but often times, that’s exactly what happens. If you’re like me, you’ve tried to keep certain items up and out of the dog’s reach, but there are plenty of times you just can’t be thorough enough! If you forget a basket of clothes fresh out of the dryer, like I do, you’re sure to lose a sock or two. Even if you have only one dog, they will often engage in tugging behaviors that will tell you a good toy for biting and tugging may be necessary. If you initiate the play, your dog is likely to become ecstatic, get that “crazy look in his eye”, and will often want to follow your lead. There are lots of theories as to why dogs enjoy a good game of Tug of War so much. Those reasons can range from boredom to instincts that predate their interaction with humans and more. It might always be a mystery, despite our best efforts to figure it out, but there are many reasons to encourage this form of play. For starters, if you only have one dog, it can be a great way to form a strong bond between yourself and your dog. We know how much they love to play, and I think they know how much we love to interact with them, so it really is a mutual benefit that they we each enjoy equally. It can also be a great way for dogs to get a certain degree of chewing out of their system, saving the destructive potential that could happen if they don’t. While some would contend that allowing a dog to engage in a game of Tug of War can teach inappropriate biting behaviors, that generally isn’t the case. In fact, most dogs that get this type of outlet are less likely to chew on things that they really aren’t suppose to chew on. When you have more than one dog, it is often instinct that leads them to play this game. One will attempt to show themselves as the dominant force and thus the game will ensue until one of them emerges as the “top dog”. Whatever the reason behind the game of Tug of War, it is very important to have a good, sturdy toy set aside for this very purpose. It will help to let them know that the game is only allowed to be played with this toy, eventually teaching the dog that other items are off limits, and it lets him know when playtime has finally arrived. Some toys are better than others, depending on what breed of dog you have, how strong their bite is and whether they like to chew more or less than most dogs. Choosing the right toy for your own dog will depend on these factors and more, so we have put together a list that should help you to sort through the differing options available. Our current favorite tug of war dog toys are at the top of the page. Mammoth’s Flossy Chews Cotton Blend 3-Knot Rope Tug is a great example of a sturdy dog toy for the game of Tug of War. You can get these ropes in extra small, small, medium, large and extra large ranging in lengths from ten inches to thirty-six inches in length. Not only does this strong braided rope help keep your dog or dogs occupied for awhile, but the fibers within the rope actually work like floss for your dog’s teeth while they enjoy play time. It might surprise you to find that their teeth will be cleaner and their breath fresher after playing with this rope for a day or two. The cotton-blend rope is especially great for aggressive chewers and will last a lot longer than some plastic toys made for chewing and tugging. It’s also great on your wallet, as it is not nearly expensive as some of the other chew toys on the market. To give you some idea of how appealing this rope chew is to puppies and dogs alike, we can liken it to the way that children often choose the cardboard box a toy comes in above the actual toy itself. 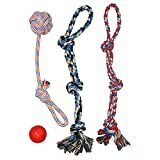 Dogs will love this rope because it feels great to chew on, it’s easy to carry, they feel like they’re really accomplishing something as they pull you or another dog across the room and they have different ways of chewing on the rope, fringe and knot, depending on how they’re feeling at the time. The West Paw Zogoflex Bumi Tug of War dog toy is absolutely guaranteed not to be damaged by any dog. Made in America, the Bumi contains no BPA or Phthalate, is non-toxic, FDA compliant, recyclable and safe to wash in the dishwasher. What makes this toy especially fun for dogs or a dog and human, is that it stretches up to twice the length of the toy for tons of fun and tugging activities. You can purchase the Bumi in size small as well as large. In addition to its very stretchy nature, this toy also floats, which makes it fun for the pool, lake or any other body of water you and your dog like to play in. Since it is super durable, any breed of dog will find this toy to be a great source of tug of war fun for as long as they are interested in playing. Odds are they will wear out and tire of play long before the toy will. This toy is great for older dogs that have problems with their teeth. Since there are no fibers for the teeth to become entangled with, there’s no chance for bleeding gums or sore teeth. It also makes it easier to take this toy away from two or more dogs that might be going a bit overboard in their play. Since there’s no chance for them to bite into the toy, it’s easier to get away from them. While this toy is guaranteed not to be damaged by dogs, some dog owners have found that their dogs can actually chew pieces of this toy off if they are particularly strong chewers. Thanks to the warranty, you can be reimbursed if that happens to you, but if your dog is known for vigorous, relentless chewing, it might be best to go with a different toy. The Tuffy Ultimate Tug of War dog toy, while still priced in a very affordable range, is a bit different from others on our list. At nearly two feet long, this soft machine washable toy is known as the world’s “tuffest soft toy”. Made with four layers of material, two of which are luggage grade, and seven rows of stitching, the bone shaped Tuffy Ultimate is covered with a fleece material and is extra durable against tough chewers and rough housers that usually need the most durable toy you can find. This toy is more likely to stand up to such abuse and come away with less damage, meaning you won’t have to replace it nearly as often. As an added bonus, there is a squeaker located in the center of the bone that adds to the enjoyment of any tug of war game. Since the Tuffy is extra durable, this is one squeaker that isn’t likely to be torn out in the first few hours of play. However, your dog will look forward to playtime because of this. This toy is larger than others like it, but it still works great for puppies who are teething. Tug of war is a favorite game of teething puppies and they will have a blast dragging this big toy around. They will feel nearly invincible as they tug and pull, playing either with you or a puppy friend. Thanks to the toughness of the Tuffy, it’s likely that they will get completely through their teething episode and still have this wonderful toy to play with. As with any toy that you give your dog or dogs to play with, be sure to keep an eye on them while they play. Even if the manufacturer rates a toy as being indestructible, there are defects that can happen that will cause it to malfunction or not be as tough as intended. Always be mindful that pieces may be chewed off, as they can create serious health problems if swallowed. If you see that your dog’s tug of war toy is becoming overly worn or missing pieces, that means it’s time to find a replacement. If it happens more quickly than you think it should, look for a toy that is rated for a more vigorous chewer or for bigger dogs. There are lots to choose from and while we try to give the most honest reviews possible, you know your dogs better than we do.